Be Aware … VERY Aware! The members of CWA of NSW are, as I write, celebrating our annual Awareness Week with activities designed to increase your knowledge of the diverse range of deeds we apply our collective efforts to addressing and how we go about achieving results for our communities. To promote our support for and involvement with the WorkCover Alive and Well Campaign. 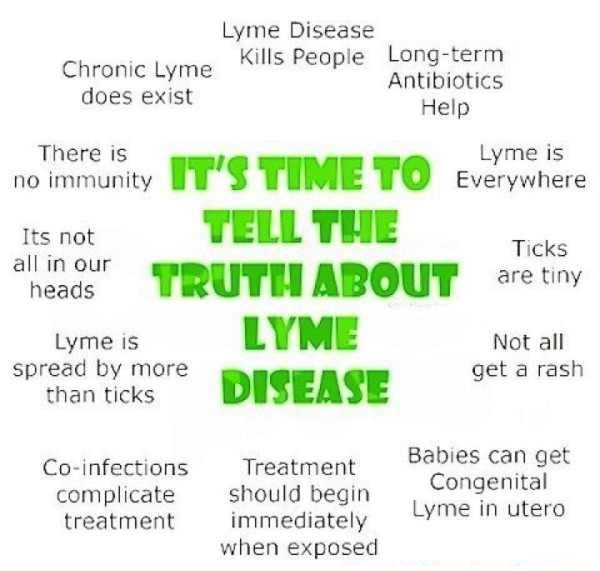 Lyme disease (borreliosis) is an infection caused by bacteria that infects humans from the bite of ticks that are infected with the bacteria. Because the disease is not recognised as being present in Australia it is often misdiagnosed as other serious conditions like Motor Neurone Disease, Multiple Sclerosis, Parkinson’s, Alzheimer’s, Chronic Fatigue, Arthritis and Fibromyalgia. 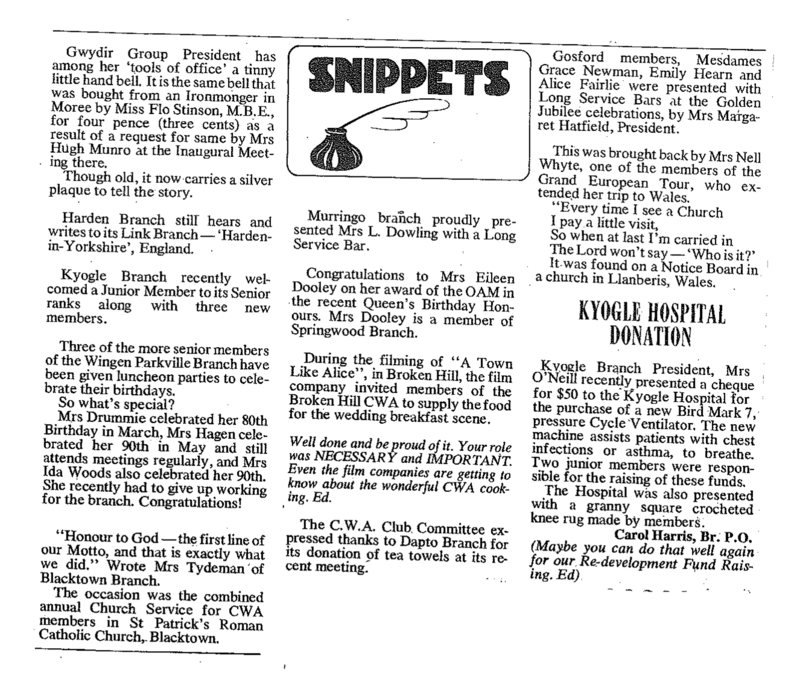 The more I read about this debilitating and sometimes fatal disease the more convinced I am that CWA of NSW has made the right decision to support sufferers of the disease, many of whom have written to express not only their gratitude but also their frustration at a system that continues to fail them. 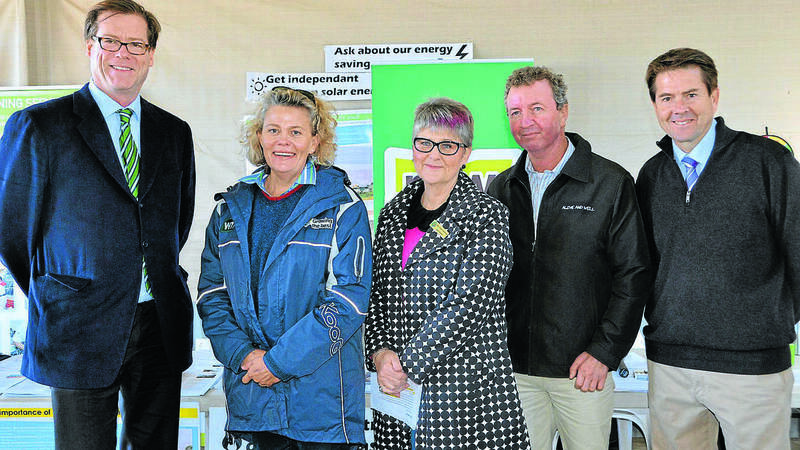 This year we are also raising awareness of the health and safety risks associated with working and living on a farm and have partnered with WorkCover NSW to support and promote their Alive and Well Campaign. Country women spend a lot of time thinking, worrying and voicing their concerns about safety and many of us have been touched by safety incidents on our farms. For many of our members, farms are not only workplaces, they are our homes and children’s adventure lands. Unfortunately, country people are sometimes averse to being given advice by those who do not work in the industry, so we are excited about the new approach being taken by WorkCover NSW to address safety on farms. This campaign focuses on farmers (real farmers!) telling their stories about actual incidents on their properties that could have been avoided. The website http://www.aliveandwell.net.au also provides the opportunity for others to contribute their tales as well as advice and support and we hope that hearing from their peers will encourage our farmers to take their safety and their future, more seriously. If anyone can tell a good story it’s a country woman and one of our State Vice Presidents, Annette Turner, will feature in media this week telling her story about some close calls on farm and when you live near White Cliffs (Google map it!) assistance is a long way off! I encourage all women on the land to get behind the Alive and Well campaign by sharing their stories and encouraging their partners, husbands and children to do the same. With over 10,000 active members across NSW, CWA of NSW will continue to raise awareness and drive change around issues important to our communities across the state. 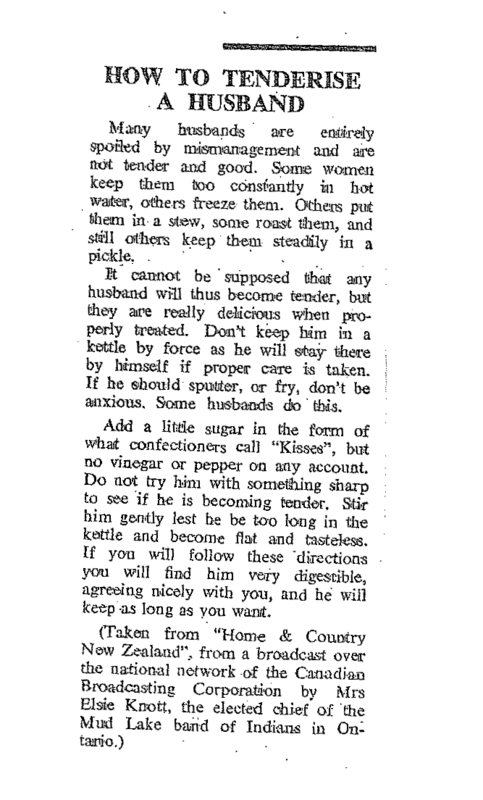 I recently had cause to troll through some old Country Woman magazines and try as I might to stick to the task at hand, I kept allowing myself to be distracted by all sorts of other interesting finds (like how to tenderise my husband!). Consequently my research took much longer than originally planned but provided me with a revelation which I can now share with you; these “snippets” are not our first! I haven’t discovered when they started or how often or long they ran for yet, but here is one for you to enjoy from August 1980, whilst contemplating karma, as I did. And in case you are curious, I will include how to tenderise a husband as well (July 1977). Cheers! It all started with a phone call in 2012 from my wonderful friend Deb Browning.. a.k.a “Thelma”! Would I like to join her and drive from Melbourne to Cairns, via Broken Hill in a “Sh*tbox” car over a 7 day period? Why not, I exclaimed – sounds like fun! I know the name “Sh*tbox Rally” doesn’t sit well with everyone – but it’s a take on good old Aussie slang for a cheap car, a paddock basher. Rules of the rally are that you have to purchase a car for under $1000.00 (incl. rego) and drive it from A to B in a week. You need to raise a minimum of $4000.00 for the Cancer Council to start the rally and at the end; all cars are auctioned off for the cause. Started by James Freeman after the loss of both his parents to cancer, the “Sh*tbox Rally” has grown over the past five years from the initial 20 or so cars of mates and friends to the nearly 200 cars anticipated to start in 2014! The rally has raised nearly 3 million dollars so far, with a hope for another $1.4 million this year. It’s not a race, you “win” the event by raising the most money, having the best fancy dress theme or by having the car least expected to make it (but does!). However, in reality, everyone wins as participants have a great time and money is found for valuable Cancer research. The camaraderie and fellowship on the rally is amazing – we ALL have a story about how Cancer has affected our lives. It’s scenic, upbeat and crazy with dress up nights and kooky characters, and a team of bush mechanics that can make literally any car finish the distance. Truly a celebration of life! 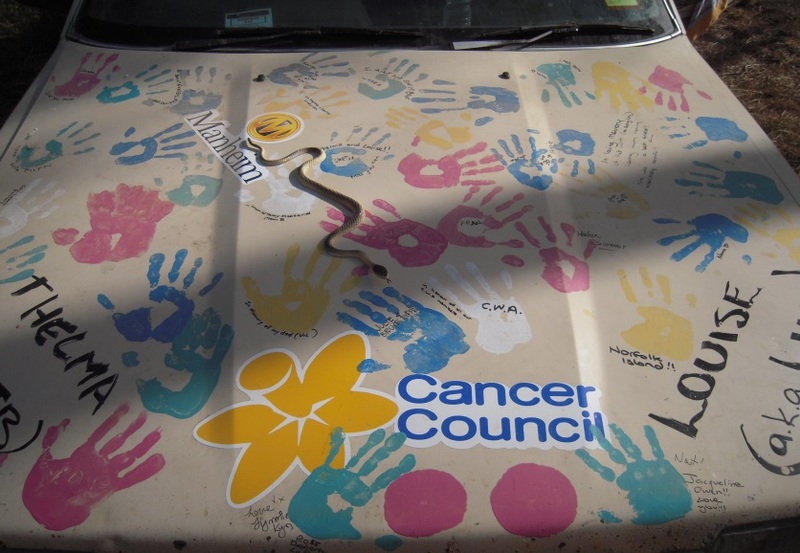 For 2012 we purchased an old Subaru L from an alpaca farm in Morisset for $1000.00, hosed it out, had it tuned and started our wonderful journey raising money for Cancer. We named our team “Thelma & Louise” and began our fundraising for our first rally. Cars have to be decorated, so we thought handprints on the car in honour of those loved and lost, and those of survivors would be a fitting tribute. With mixed feelings we acknowledged that the car looked fabulous, yet it was a sign the Cancer shows no discrimination – it takes young and young at heart. Then with 9 weeks to go, I was diagnosed with Breast Cancer and needed a double mastectomy. Wow.. I didn’t see that coming! My oncologist was great (even if he thought I was crazy to want to drive over 7000 klms – 7 weeks after surgery – in a 1990 Subaru) and had me up and running in no time. Although I don’t recommend this as a fundraising pitch, my diagnosis seemed to raise awareness and make our cause all the more personal. Our donations skyrocketed and we came 2nd with nearly $19K and had the trip of a lifetime along the way! Country towns host the rally en route and I am pleased to brag that Tibooburra CWA still hold the title of best food and service for the rally over the past two years! Around 9 ladies catered for nearly 400 people, dinner and breakfast in the main street, plus takeaway lunch packs and did an awesome job – well done Kath and the girls! So we lined up again in the 2013 event with another Subaru L – this one from Cooma (so she is nicknamed “Snowy”) and last year drove from Sydney to the start line in Adelaide then to Fremantle W.A. via Uluru! Another fantastic journey across the Australian Desert with some 360 other crazy folk in all sorts of “Sh*tboxes”. We could not part with “Snowy” so we bought her at the auction and left her at a friend’s farm in W.A. ready for 2014 Rally starting from Perth. On 31 May, 2014 we will be departing the Western Australian capital and travel to Darwin, via the Kimberly Ranges and Gibb River Road. 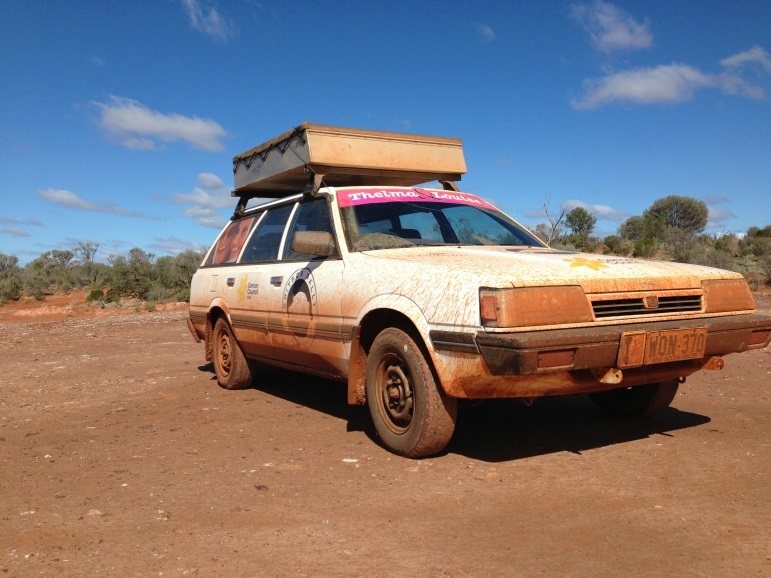 “Thelma & Louise” and “Snowy the Subaru” will not only do the rally, but this time we are bring our trusty little Subaru home with us – so by the time we return home to Sydney, Deb and I would have covered the entire country in a “Sh*tbox” and raised nearly $30K for Cancer. What a fun way to fundraise! 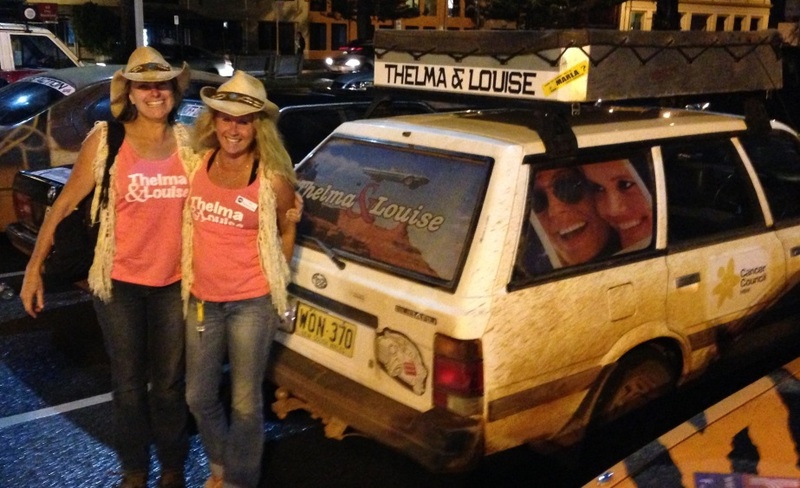 I am sharing my story with you all as CWA of NSW has decided to sponsor “Thelma & Louise” in the “Sh*tbox Rally” for 2014. We cannot thank you all enough for the generous offer of $2500.00 for our team and the Cancer Council of NSW. Deb and I are humbled by this support and know that this money will be going towards valuable research to try and stop Cancer in our members and our society. Our team “Thelma & Louise” has a facebook page https://www.facebook.com/pages/Thelma-Louise-in-the-Sh*tbox-Rally/258341294214178 where you will be able to keep up with our progress and watch our adventure unfold. The “Sh*tbox Rally” also has a webpage http://www.Sh*tboxrally.com.au/you-re-doing-what in case you are thinking of maybe doing this event in 2015? Why not!